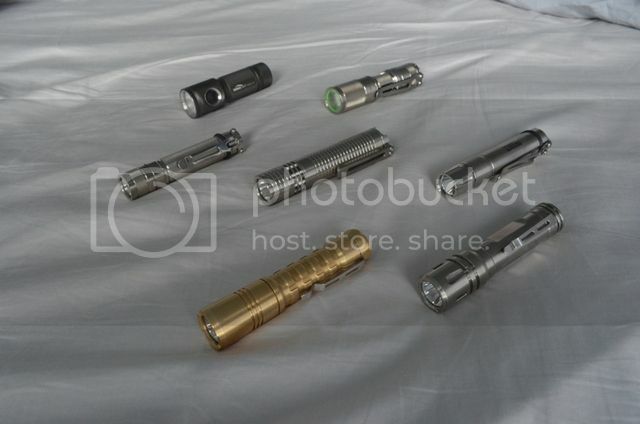 This is a review of the prototype of the ReyLight Ti Lan flashlight. A sample was provided for this review but no payment of any kind was accepted for the review. Lan, means Orchid (an exotic flower), elegant, and graceful. 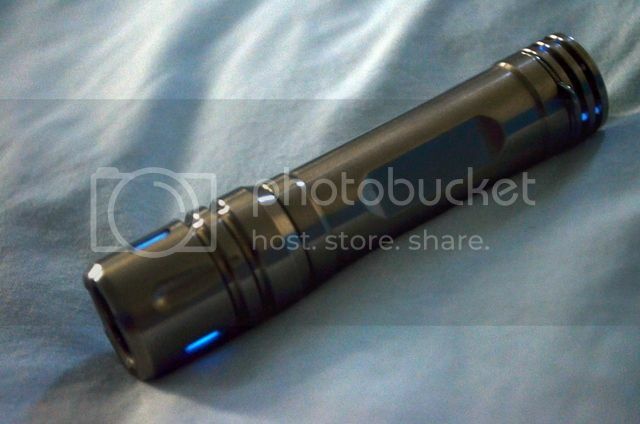 This is an apt description for Reylight Ti Lan flashlight under review. You may find many similarities between this review and that of the Reylight Pineapple (seen here). This is because, functionally, they are the same light but with some enhancements and a stylish, premium, titanium shell. Overall, this is an outstanding and unique light. It offers high-end materials, excellent functionality, premium options (ie. 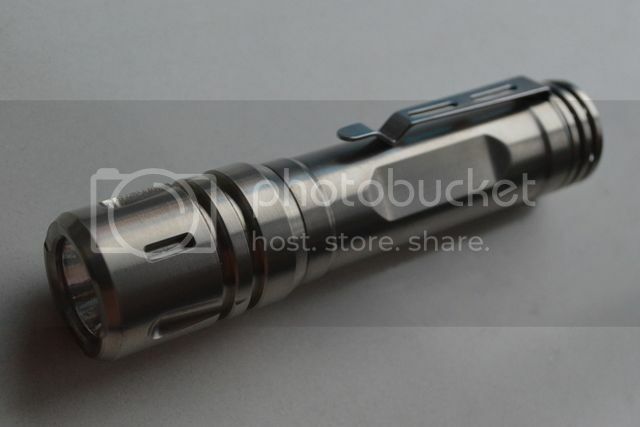 10 slots for tritium vials) coupled with a staggeringly low projected price ($50-60). The host is nicely machined with some intricate and interesting detailing that produce a unique look and feel. The light fits well in the hand and has a solid, weighty feel without being too heavy. 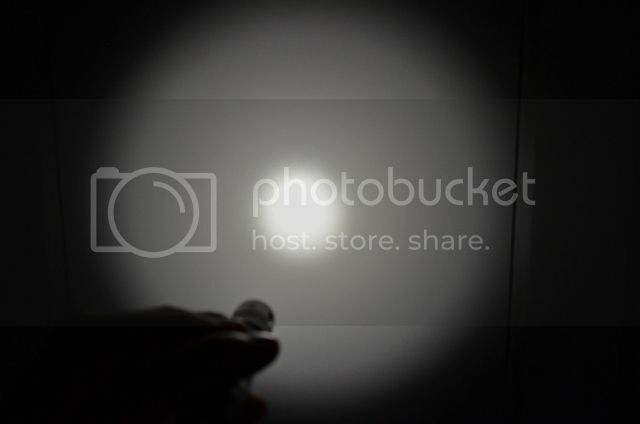 The clip has a functional lanyard attachment point and mates well with the light. The UI (User Interface) is simple and effective with four well-balanced levels. They do vary depending on the battery used (14500 Lithium Ion cells boost the thre e higher modes), so one can choose optimum lower modes (using nimh batteries) or maximum output (using 14500 li-on cells). 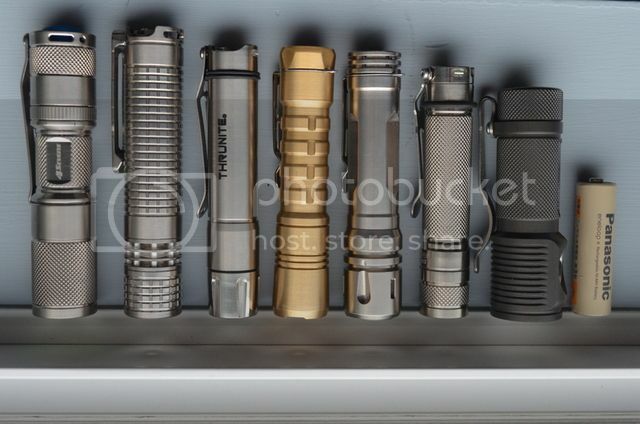 The light boasts a total of ten (10) tritium slots, allowing one to customize as much or little as desired. When fully loaded, the light is practically a beacon at night, and is not likely to be misplaced. 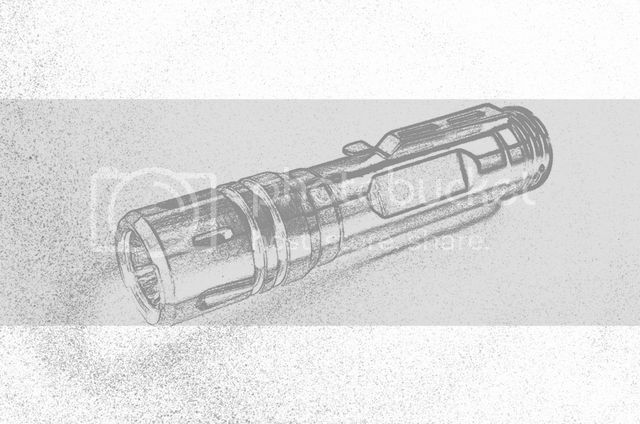 This, however, will more than double the price when all ten tritium vials are installed (the common 1.5×6mm tritium vials fit the slots. They typically cost $7 – 7.5 each, not including installation). A firmer production clip. It’s still a bit thin and small, but provides adequate clip strength. The middle and high modes still use PWM, but the frequency has increased greatly (from 2KHz to 9KHz) so it is virtually undetectable (virtually… It can be detected in rare circumstances). The reflector and centering disk have been redesigned, eliminating the rings found in the previous design. The beam has a more focused hotspot that provides more throw but may be a bit less ideal during close range use. This is a near final prototype, so very few changes are expected. I don’t feel there is a need for any changes. The production model will likely be available at Banggood and perhaps on Massdrop. 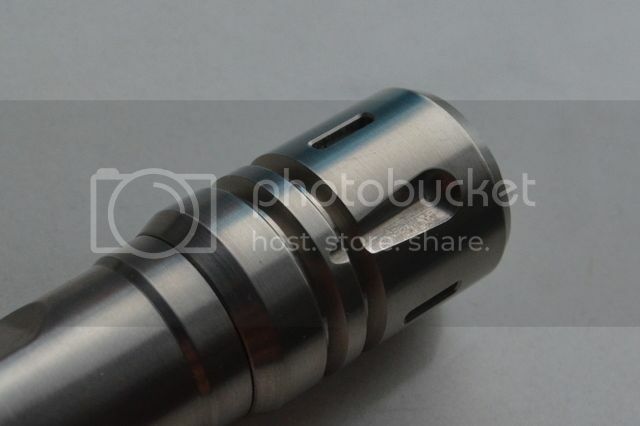 The machining and finishing on the titanium host is well done. The detailing provides some grip but the lack of knurling may make the light a bit slippery in some circumstances. The material is Grade 2 Titanium, or commercially pure. It has better heat conduction than the popular Grade 5 Titanium (6Al-4V) but is not as tough/durable. 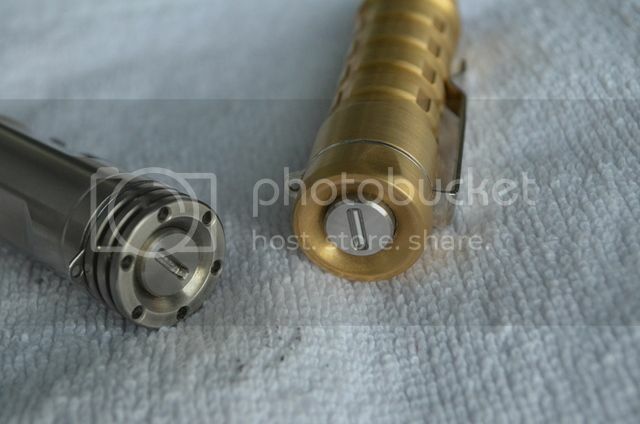 The finish is a lightly-polished machined finish. Production lights may skip the polishing step. I’m a fan of nicely machined titanium so I don’t feel this is a drawback. 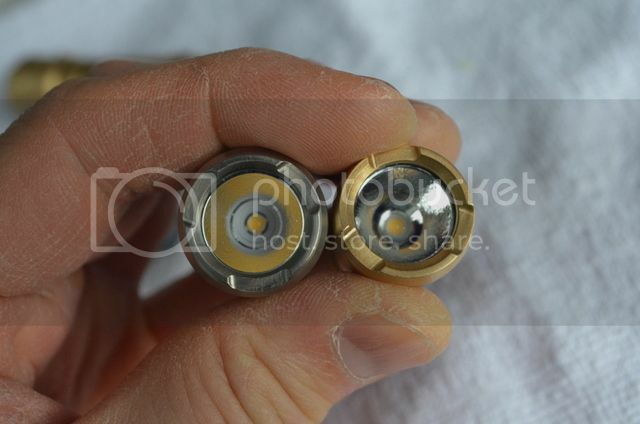 The head has two large concentric grooves as well as an alternating pattern of large tear drop cut outs and slots to fit tritium vials (also known as trits). There are a total of three trit slots on the head. The body is fairly simple, with a slightly reduced diameter centre section. The centre section contains three flats that can be used for branding etc., but are left blank here. 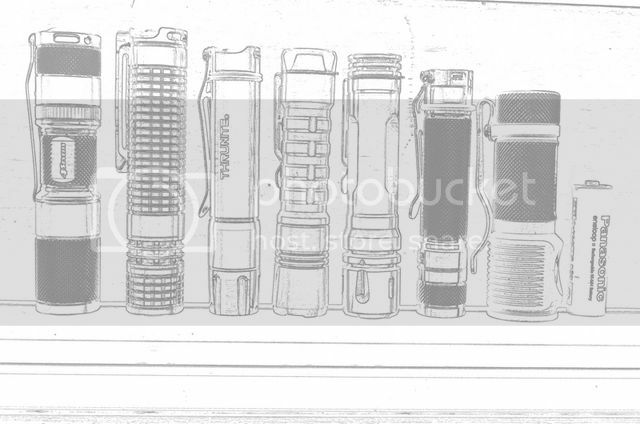 Here is another view of the light showing the clip with the lanyard attachment point incorporated into the design. While it is functional, I found the lanyard loop a bit uncomfortable at times and may remove it in the future. 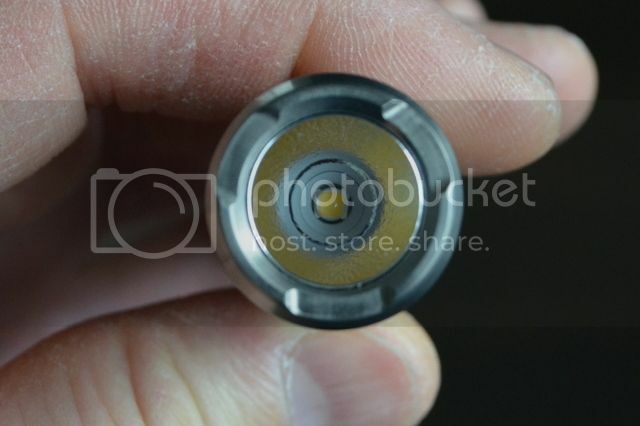 The clip is held on by the tailcap which is a great design since it’s reliable and allows adjustment of clip position. It is, however, a bit thin but did provide adequate clip strength. The tail section has two concentric rings and is drilled to fit a total of six trits. The trits are visible on the tail as well as through the rings. It’s a stylish and functional touch. 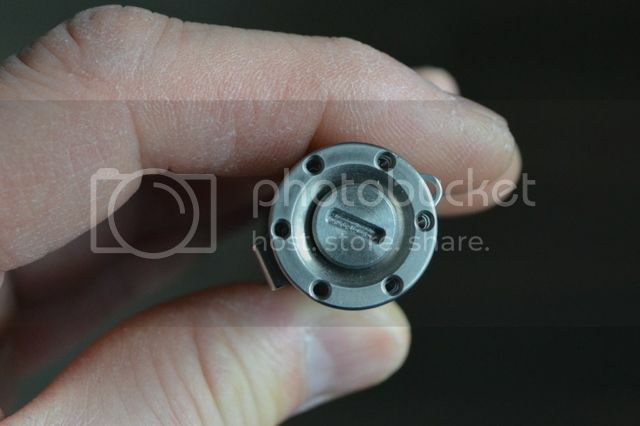 The button cover is stainless steel and works well. The switch is a reverse clicky to allow for intuitive mode changes and operates smoothly with no binding. The switch travel is a bit more than expected but it’s not uncomfortable. 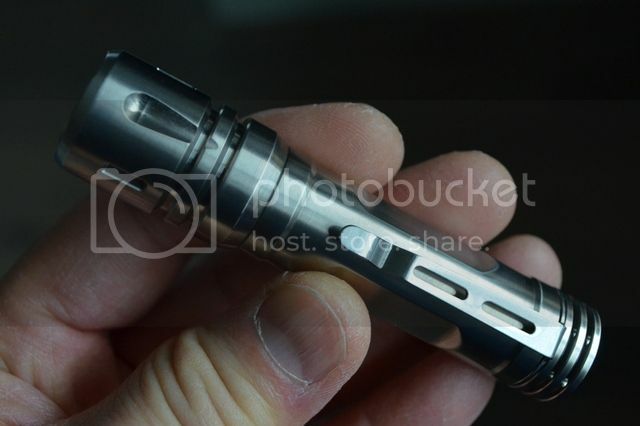 The angled recess around the button adds just a little bit more class, as does the tritium slot. 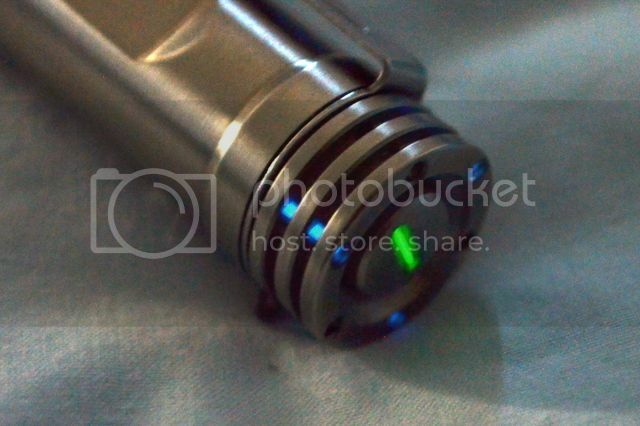 The production light may use titanium for the button. While this seems like a nice touch, I often find that titanium buttons bind and gall horribly, producing a cheap and unreliable feel. This can be alleviated with careful machining and/or finishing, but I am wary of the end result if titanium is used. The button has been machined a touch shorter than on the pineapple so the light tailstands reliably without wobble. It is seen here next to the pineapple. As has been reported with the pineapple, there is still a bit of play in the button. This can be fixed by placing a shim layer between the switch and the metal button cover. I use a couple layers of glow sticker. The threads are nicely cut, but do tend to grind a bit as do most titanium threads. They are not square cut, but there is very little play and they mate well. The head has three crenulations that allow one to see when the light is on even when it is resting head down. Here it is next to the similar pineapple. One minor annoyance for me was the way the parts did not quite line up. The tailcap, body, and head have details that do not quite line up when fully assembled. Again, this is a just minor annoyance but is noted to be complete. r9050, sm405, d240 flux, this may change in the future of course. Size is a very comfortable 92.9mm x 21.15mm at the widest point of the head. The body varies between 18.15-19.0mm so feels slim in the hand. The pill is held inside the head by a retaining ring. Once the ring is removed, the pill can be removed and the reflector and lens will drop out. Note the white plastic centering ring around the LED. 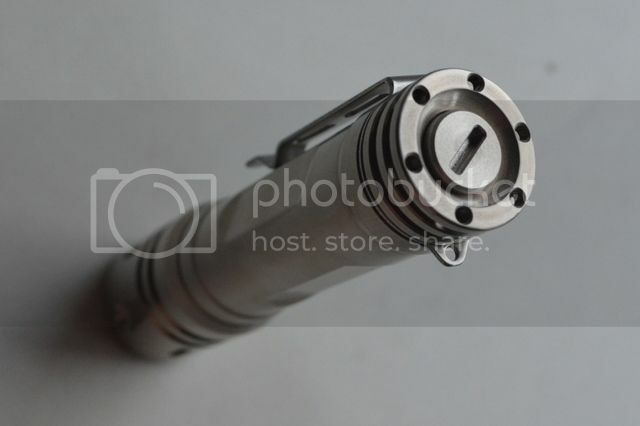 The driver is a useful 14.55mm, a very useful size. Shown here next to the Brass Pineapple. The reflector seems to be a custom design that produces a good, clean beam. 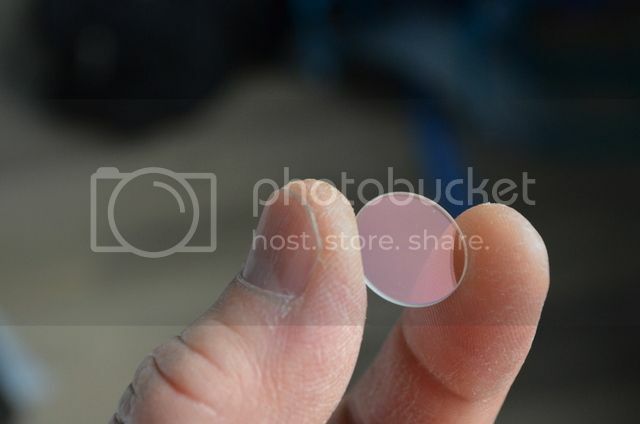 The lens is anti-reflective (AR) coated. 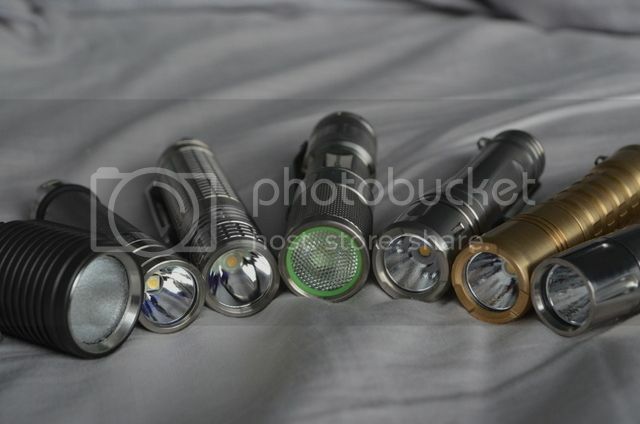 Here is the light compared to a common AA battery as well as a few other available AA lights. 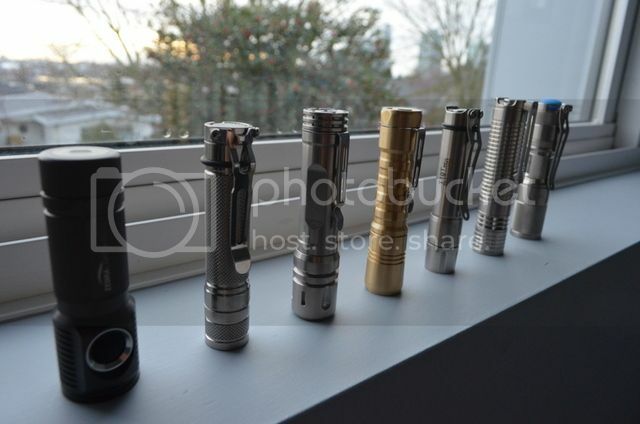 The lineup includes (from left to right): Quark AA Tactical (Ti), Firefly Ti, Thrunite T10T, ReyLight Brass Pineapple, ReyLight Ti Lan, Eagletac D25A Ti, Zebralihght SC5w, and an eneloop battery. The beam is good. The textured reflector provides a somewhat wide spot and spill, with a fairly sharply defined cut-off to the spot. The improved reflector eliminates any rings in the beam. Here is the beam (on the left) next to the previous Pineapple light. The improved reflector eliminates the rings in the beam and focuses the spot better, allowing for more throw. 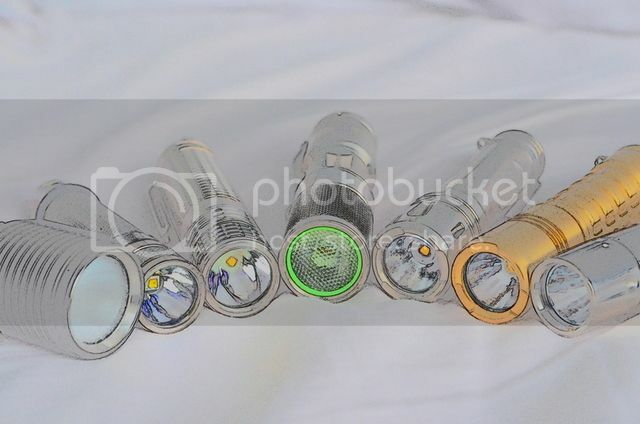 The LED is a 4000K Nichia 219C, 90+ CRI, a fairly rare LED not often seen on production lights. This is a beautiful tint and the 219C should be very easy to drive, providing good output and efficiency. The UI is a basic Moonlight-Low-Medium-High, starting on moonlight. There is no memory and the reset time is a short three seconds (after the light is off for three seconds, it defaults to moonlight.) There are no blinking or hidden modes. I don’t have the equipment or inclination for lumen and runtime measurements, so here are the factory numbers. These appear to be LED output numbers, so actual out-the-front output is likely to be about 15 – 20% lower (to account for losses due to the reflector, lens etc.). I can confirm these approximate numbers. The UI and levels are well balanced and nicely spaced. Choosing differing battery types allows one to choose between higher maximum output (14500 batteries) or more available lower levels (nimh batteries). I’m very pleased with the simple, effective UI and useful levels. This is an ideal UI for most of my EDC usage, though it is not for everyone. The levels using nimh batteries are well suited to indoor use. The extra output using li-on batteries, however, is welcome in outdoor usage (100 lumens doesn’t seem like much outside). This is NOT a tactical light or a tactical UI. 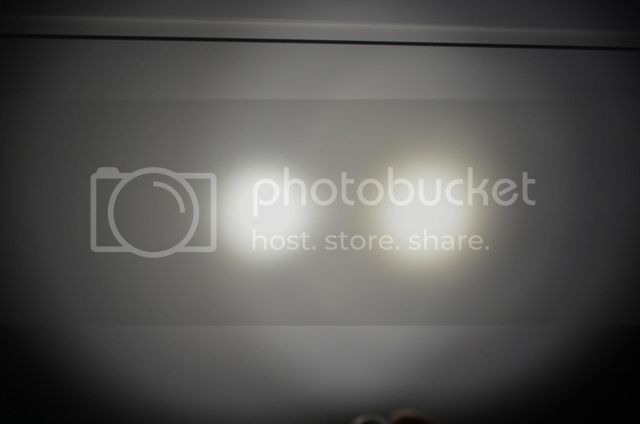 If you want max brightness quickly or like memory modes, this is not the light for you. If you like preserve night vision and discretely ramp up to your chosen level, this light is ideal. Do note, however, that the middle and maximum levels use PWM for dimming (at a reported 9KHz for the frequency). I did not find it objectionable in use but did notice it on very rare occasions. I didn’t notice any PWM on the moonlight mode. The redesign of the reflector and centering disk do not allow me to add glow stickers in the head. However, adding trits provides plenty of glowy “bling”. 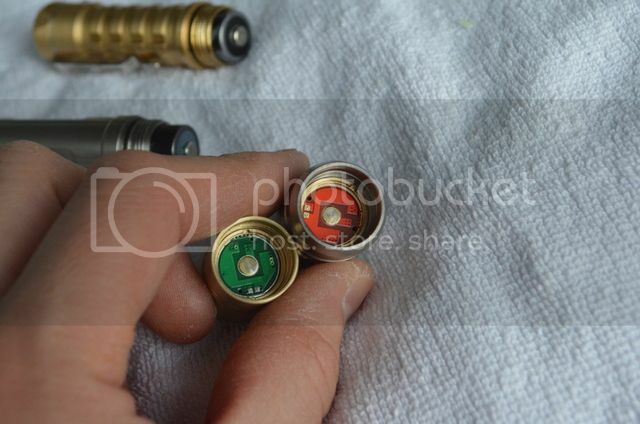 Note, I only have three of the six trit slots in the tail filled as I am waiting for an order of tritium vials to arrive. Overall, the ReyLight Ti Lan is definitely my favourite AA light. Elegant appearance that is both classy and functional. 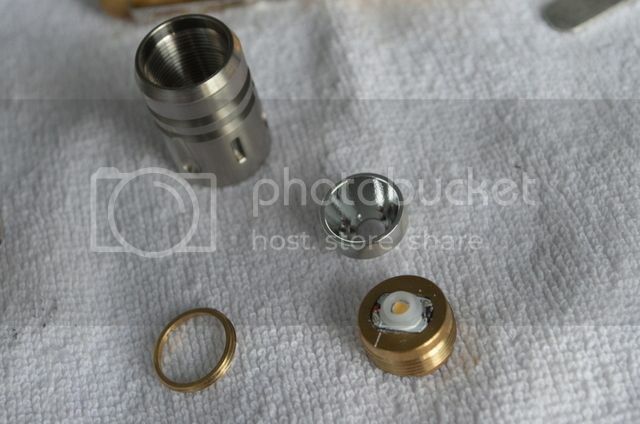 Very rare 4000K, 90+ CRI Nichia 219C LED. Efficiency coupled with beautiful tint and colour rendering. Good fit and finish with thoughtful details (clip mounting, lanyard attachment, head crenulations, multiple trit slots, and solid construction). Useful levels with (my) ideal EDC user interface. Changing battery types allows one to customize levels based on intended usage (more lower modes or max output). 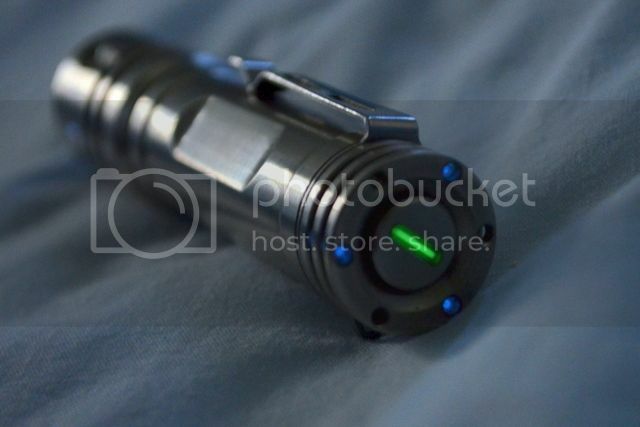 Classy metal button, equipped with tritium slot. 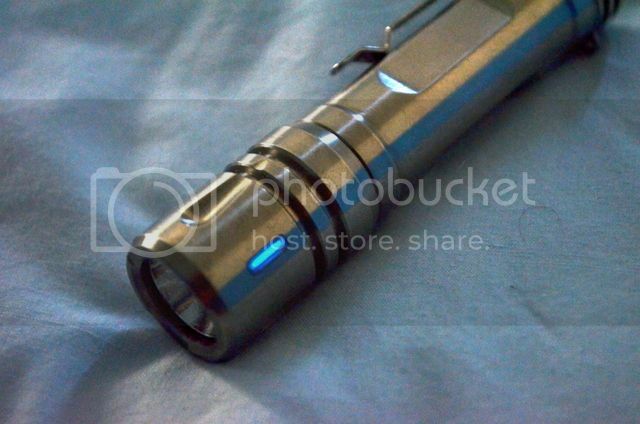 Unbelievable value (under $60 projected price), especially for a Titanium light. Here’s an artsy parting shot! Note. I’m still fixing the format etc. In progress. This is one good looking light. Wish I had the funds to snag one! Nice… too flashy for my tastes but cool none the less. Love it! Thanks gunga and I can’t wait for this one! Thanks for the review Gunga. Good work Rey! Great review Gunga and can’t wait to lay my hands on this beauty. When is going to be up for sale? Not for sale yet. Price should be under $60. Yeah. That’s why I’m so excited. This does not include any trits though. Keep that in mind. Thanks for another fine review, Gunga. My two nits about the Pineapple version were the ringy beams and the weight from the brass. Glad to see that the rings are gone. How does this Ti version compare in weight to the brass model? Are any of the ReyLights available as a host only? Hatman. The ti is substantially lighter. I don’t have a scale to quantify it but it is lighter. Note that Rey has replacement reflectors, just ask. No. No ReyLight AA as a host. Already in holiday, crazy 20 days. Woo Hoo! Rey on the loose! Maybe Rey will be able to find us a good deal on trits? I have the trits waiting for this light, which will the only light I will buy this year. Promised. However, if there would be a deal on trits, I might buy two of these. But I can’t think of any brand introducing a prettier light which exactly fits my AA/14500 needs this year. Well BazzH I must say thanks for the laugh, I say the same every year and still end up buying many more lights than I ever intended to, hum, for whatever that means.. ha, I suppose I’ll stop buying when they start producing more ugly lights. This will be my first Trit light (although I’ll buy it sans-trits and add). Beautiful, can’t wait! Thanks for the feedback guys. I’m waiting for the production release too. Can’t stop at just one! Bump. Any news? I’ve got the trits, now eagerly waiting …. Production could be finished in middle March. Looks very cool. 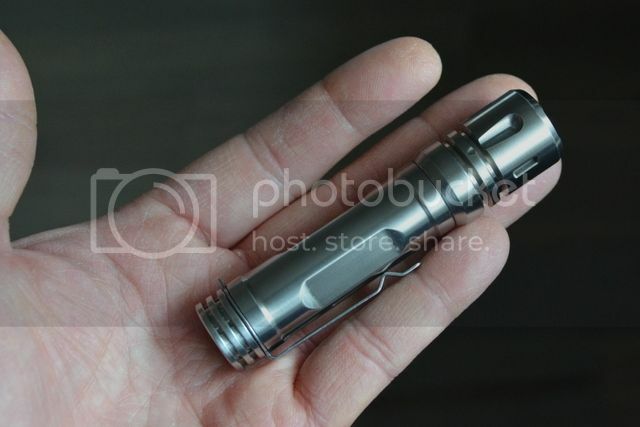 I would say that if this lights falls in the expected price range, that this could very well be my first Ti light. They are expected to be on massdrop in mid March.